Syria's army has overrun the strategic border town of Qusayr in Homs province after a blistering offensive spearheaded by thousands of fighters from Iran’s Shiite Lebanese Hezbollah movement. Rebels said they had pulled out of Qusayr, which lies on a cross-border supply route with neighboring Lebanon and where they had fought fierce battles with government forces and Hezbollah guerrillas for some three weeks. One Hezbollah fighter told Reuters they took the town in a rapid overnight offensive. Hezbollah and Syrian forces fought hard to seize Qusayr, which had been in rebel hands for over a year, to reassert control of a corridor through the central province of Homs which links Damascus to the coastal heartland of President Bashar al-Assad's minority Alawite Shiites. 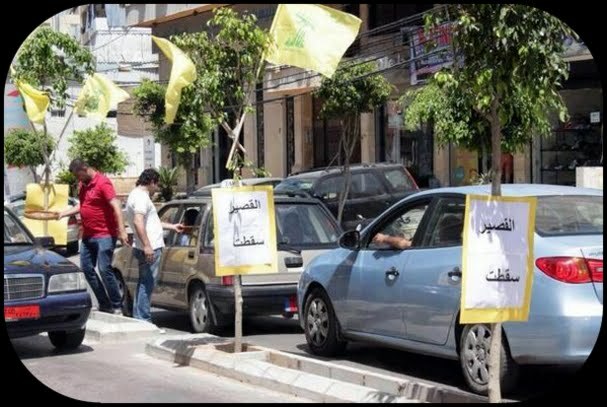 Hezbollah supporters in Beirut's southern suburbs celebrated the fall of Qusayr with gunfire, fireworks and placards and by handing out sweets and candy to passersby. Iran, which is Hezbollah’s overlord and Assad’s key regional ally promptly congratulated Damascus on retaking Qusayr, according to Iran's Press TV. A video uploaded to YouTube today by the Qusayr Media Center headed by citizen journalist Hadi el-Abdullah shows some of the hundreds of injured trapped in the town, including a boy with missing limbs. Some are shown being moved from makeshift field clinics onto the back of pickup trucks. Over the weekend the UN said it was “extremely alarmed” by reports there were as many as 1,500 wounded people in Qusayr. Doctors had appealed for the Red Cross to be allowed in to treat the wounded, but Syrian officials said this would only be permitted once the rebels had been defeated. Civilians who had managed to flee Qusayr described it as "a ghost town, heavily damaged and filled with the sound of bombs," the UN refugee agency UNHCR said yesterday. Those who had escaped were mainly women and children, because men risked being killed at checkpoints, said spokeswoman Melissa Fleming. “From the handful of interviews we have done so far, it appears that a new route for displaced people has opened up from the Qusayr area towards Arsal in Lebanon, about 100 kilometers away,” Ms. Fleming noted. She also said that some people flee to Lebanon while others are displaced internally. The refugees -- mostly women and children -- said the difficult journey to the border has to be made by foot. “Fighters are said to be targeting people as they try to flee. No route out of Qusayr is considered safe, and there are continued reports of between 700 and 1,500 injured civilians being trapped in Qusayr,” Ms. Fleming said. “Those we have spoken to say it is unsafe to flee with men, who are at heightened risk of being arrested or killed at checkpoints along the way. None of the refugees was able or willing to identify those who are manning the checkpoints,” the spokesperson said. It is obviously a big blow, not just tactically but psychologically, for the rebels. But we have seen these tactical ebbs and flows before ... People have made far-reaching conclusions that have assumed that these temporary shifts in momentum signify the beginning of the end for either side. I think that is simply premature. There are still huge swaths of Syrian territory that, I think, are permanently out of control of central government. There are places in the country that are never going to be reclaimed. So I think it’s hard to think of a scenario whereby we can talk about Assad winning. These limitations are going to carry on into the foreseeable future. It’s hard to see how this becomes a model for reclaiming control of the entire country. Clearly having Hezbollah engaged in an open and dedicated fashion, not only infused new numbers into the fight, but also well-trained and disciplined fighters. Obviously they did make a very big difference in Qusayr, as has Iranian technical, logistical, and planning support. Hanna was also pessimistic about the possibility of a diplomatic breakthrough at the Geneva-2 conference. We are at a strategic stalemate and this is something that could go on for years. I imagine there is going to be a political settlement to this war at some point, but I don’t think that is in the near term ... There is not going to be any resolution or progress at Geneva, if the talks happen.